Taste of Italy: It is Truffle season! A recently purchased White Truffle from Savigno, in the Province of Bologna. One of the things I love about living in Italy is that everything has its season and there is always something to look forward to. In late autumn- early winter we see the arrival of Truffles, among other long awaited items butternut squash, several types of pumpkins, many radicchio varieties, apples, pears, quince, nuts, etc., etc. There are many varieties of white and black truffles and as of October 1st, the most prized variety of white truffles has hit the market! The white truffle grows wild in Piedmont, the Appenine Mountains of Emilia-Romagna (ER) and also the area around Marche-Umbria. The Alba white truffle is probably the best known but Savigno (Emilia-Romagna) and Acqualanga (Marche) also have fabulous white truffles. At the end of this post you will find a partial listing of types of truffles. What exactly is a truffle? A truffle is the fruiting body of a subterranean fungi; spore dispersal is accomplished through fungivores, animals that eat fungi. Almost all truffles are ectomycorrhizal and are therefore usually found in close association with trees. There are hundreds of species of truffles, but the fruiting body of some (mostly in the genus Tuber) are highly prized as a food: Brillat-Savarin called them "the diamond of the kitchen". Edible truffles are held in high esteem in French, Spanish, northern Italian and Greek cooking, as well as in international haute cuisine. A traditional way to serve truffles is to serve them with freshly made egg pasta and butter. In the case of the white truffle, it is shaved directly over each diner’s pasta. If ordering this at a restaurant, be sure to ask for the price of the truffle before you order to avoid any surprises (the white truffles can command over 4,000€ per kilo!). *Watch this video to see some of the ways you can prepare truffles. How to choose a Truffle? When purchasing fresh truffles, consider that truffles, especially white truffles are very perishable and need to be consumed within 2-3 days of purchase. A fresh truffle should have a strong smell vs a weak smell the scent gets weaker as time passes. Another sign of freshness is it should be fairly soft when you slice it. If its dry it is not fresh. If it shows any sign of mold or smells moldy; it should not be eaten. How much truffle to buy? Well that depends on whether you want a touch of truffle or a lot of truffle! Having said that, plan on 5-10g of truffles per serving for a first or second course. How to conserve your fresh Truffle? Wrap it in a piece of clean paper towel or napkin and put in a plastic bag, tie it closed so it will not dry out. Do not place in rice as it will cause your truffle dry out and/or mold. How to clean your truffle? First remove as much dirt as you can with a medium soft brush (toothbrush or nailbrush) and no water. If you have purchased the truffle, there is most likely a small amount of dirt on it. 1. One person says wet a medium soft brush (toothbrush or nailbrush) and use it to brush the truffle clean, when completely clean, rinse quickly under cold water and pat dry immediately. 2. Another person said to use a soft brush and brush the truffle clean under a thin stream of cold water. When completely clean, pat dry immediately. 3. Still another person says you should only use a soft brush and brush the truffle all over until you remove all of the dirt. If necessary use a toothpick to remove dirt that is stuck in crevices and then continue brushing until you reach the light ivory color of the truffle. What they all agree on is that the truffle should only be cleaned right before before using. That the truffle should not be soaked in water. 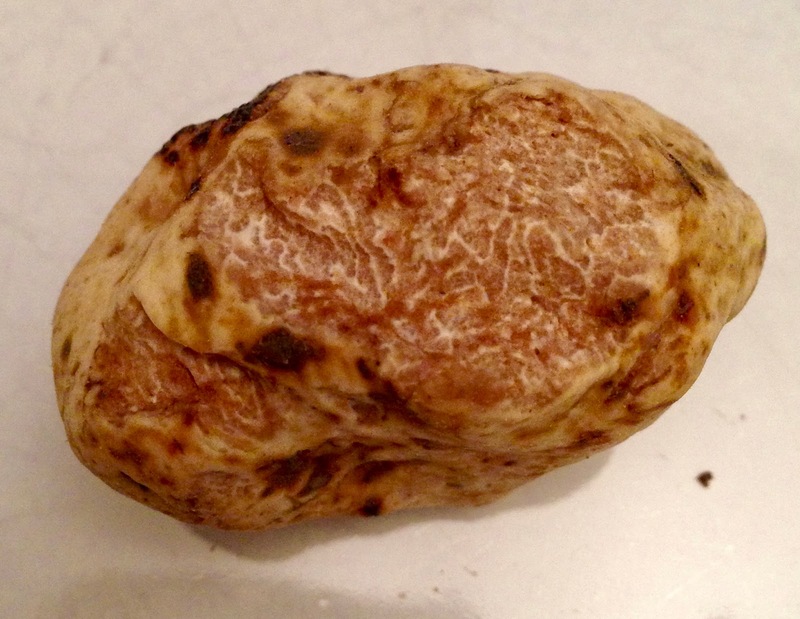 This is a list of the popular types of truffles found at Tartufi Unlimited. I will add more varieties as soon as I finish my research. The Italian White Alba truffle is most expensive truffle sold today. The Italian White truffle has a smooth "felt-like" surface, and ranges in size from that of a marble to that of an American basketball. The combination of the Italian White truffle's rarity and strong perishable nature, causes this truffle to fetch the high prices it does. The Italian White truffle has a strong cheesy-garlic aroma, but to many, smells like that of a turnip. The Italian White truffle should only be purchased after mid- September, because before this, can have a large presence of fly larvae inside the truffle. The Italian White truffle's flavor is destroyed with heat and should not be cooked. The Italian Summer truffle is found in abundance throughout Europe, however more commonly is found in Italy. The Italian Summer truffle, also known as "Scorzone" in Italy, has an almost alligator skin texture, and tastes much like hazelnuts. The Italian Summer truffle ranges in size from that of a marble to that of a softball, however is most commonly found around the size of golf balls. The Italian Summer Truffle is found between May and August, and has an immense amount of flavor for its price. The Bagnoli Truffle is a common European truffle, resembling the Summer truffle, however is not widely known in the U.S. for its aroma resembles phenol and what is best described as a sharpie marker. However if the Bagnoli truffle is placed out in the open air, or warmed slightly when cooked, its flavor can change to that of the Summer truffle, a hazelnut, earthy taste. The Bagnoli truffle can reach to the size of American Basketballs, and is often used in truffle products, throughout Europe. The Bianchetto Spring truffle is a white truffle that grows in Italy. Its exterior is much darker than that of the Italian White truffle, however has an excellent flavor, resembling the same cheesy-garlic attributes. The Bianchetto truffle has an even shorter shelf life than that of the Italian White Truffle, but is a perfect substitute to the high priced winter cousin. I would like to add this truffle to the list as the Chinese Truffle has made headway into the truffle market. Follow the link below for an in-depth list and photographs that will help you distinguish the various types of Chinese truffles. Read THIS before you buy! Remember these names and remember to always read the label to know what you are buying!